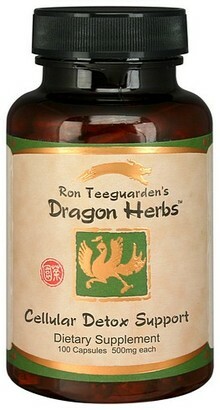 Traditional Chinese Medicine Cellular Detox Support Formula. Cellular Detox Support™ is a very useful classical Chinese formulation used to support the normal detoxification processes required by the body to establish and maintain health. It is famous in the Orient for maintaining the cleanliness of the lymphatic system and thus for naturally removing toxins from deep within the body on an on-going basis. This classic formula has excellent skin cleansing effects. This formula has been used for over a thousand years, by many millions of people, and is still widely used today in Japan and China. Bupleurum Root, Arctii Fructus, Rehmannia Root (Prepared), Platycodon Root, Licorice Root, Mint Leaf, Forsythia Fruit, Trichosanthes Root, Scutellaria Root, Coptidis Rhizoma, Phellodendron Bark, Gardeniae Jasminoidis Fructus, Dang Gui Root, Peony Root (White), Ligusticum Root, Ledebouriellae Sesloidis Radix. Other Ingredients: Vegetarian capsules**, Rice Hull Extract, Calcium Stearate. Bupleurum root, platycodon root, chinese licorice root, chinese mint leaf, arctium lappa fruit, forsythia fruit, trichosanthes root, scutellaria baicalensis root, coptis rhizome, phellodendron bark, gardenia fruit, dang gui root, chinese white peony root, preparedrehmannia root, ligusticum chuanxiong rhizome, siler root.